2 WHITE JET SURF GP 100’s AVAILIBLE!!! JUST IN TIME FOR SUMMER! BOTH BOARDS ARE 2 YEARS OLD AND PURCHASED BRAND NEW. THESE ARE GREAT MACHINES, SAD TO BE SELLING THEM. It’s the ultimate water sports toy. 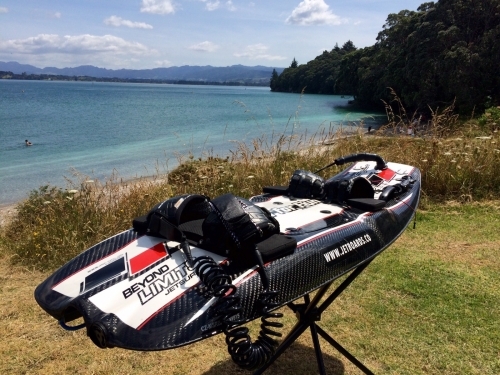 These boards eliminate all the hassles that come with surfing, wakeboarding or kitesurfing and have you reaching speeds up to 55km/h in a matter of seconds. A custom designed carbon-fiber hull equipped with a 17hp, 6kg two-stroke engine, an exhaust system that works with backpressure of sound waves, this machine is unlike any engine in the market today. This makes the motorised surfboard the greenest petrol driven personal watercraft in the world, producing only 210grams of CO2/hour at full speed. It has been especially developed to minimise environmental impact. Using the most advanced technology, engineers have reduced the total weight of the board to 15 kg, or 33lbs. Having passed homologation standards for noise emissions, the board complies with the emission limits set for motor vessels. The complete drive unit is certified and approved by the European Commission and received the European Union label, CE. Brand new these Jetsurf boards were priced at $22,500 and are in limited supply with 6-8 week lead times. But by buying these boards now, you get a great running used board at a much cheaper price. I have 2 of these boards with 3 others available if required. I have personally flown both domestically and internationally with these boards and found them great to have on holidays or easy storage on a boat or a vehicle. spare timing sensors, bilge pumps, sparkplugs and oil. Also I’ll write up a general maintenance list for you to have, these boards if looked after are super reliable. But they need to be loved to keep giving a fantastic performance. Also as these boards where intended to be used as part of a business. So the documentation for Maritime NZ sign off to operate as a business is also available to be discussed for a negotiated fee if someone was looking at the boards as a venture. •	Racing Impeller Li-FePO4, the battery is not recharged by the engine, there is no accumulator, therefore the driving time without battery recharge is approximately 4 hours. •	The Jetsurf is equipped with an automatic electronic control unit with auto start/stop function.